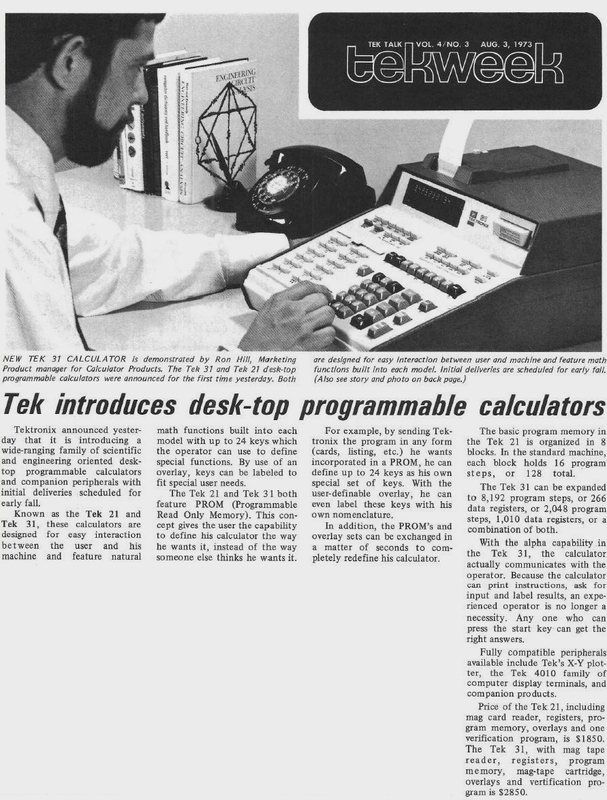 This is a scan of Tekweek, Tektronix' internal company newsletter, with the cover story being the August 2nd, 1973, announcement of the Model 21 and Model 31 calculators. These calculators were follow-on's to the Tektronix 909, which was a calculator that was developed and sold by a company called Cintra as the 909 Scientist. Cintra was acquired by Tektronix in May of 1971. The Tektronix 21 and 31 calculators were essentially Large-Scale Integrated (LSI) Circuit re-implementations of the Cintra 909 calculator design. The LSI ICs were fabricated by American Microsystems, Inc. (AMI) based on logic designs from Tektronix. The Tek Model 21 calculator was essentially a redo of the Cintra 909 using the AMI-made LSI-chipset, and the Tek 31 calculator incorporated the core calculating engine of the Tek 21, with an augmented version of a peripheral for the Cintra 909 calculator called the 926 Programmer that added full programmability, along with a magnetic tape storage capability to the 909 calculator.